Well, here we are at the end of another year! I didn’t write a year end blog post last year because, to be perfectly honest, it wasn’t a great year and I was feeling a little disgruntled about it. In 2018 some things really came together both musically and personally and I’m feeling excited again, so here we go. In 2018, we got the full band out twice, trios a few times, and a handful of duo gigs. Though we didn’t play a whole lot this year, the shows we did play included some pretty great ones. The big show of the year for the Quintet was at the Sasktel Saskatchewan Jazz Festival. We played to a great audience at the Nutrien Club Jazz Freestage. We experimented with some new tunes and had a lot of fun doing it. 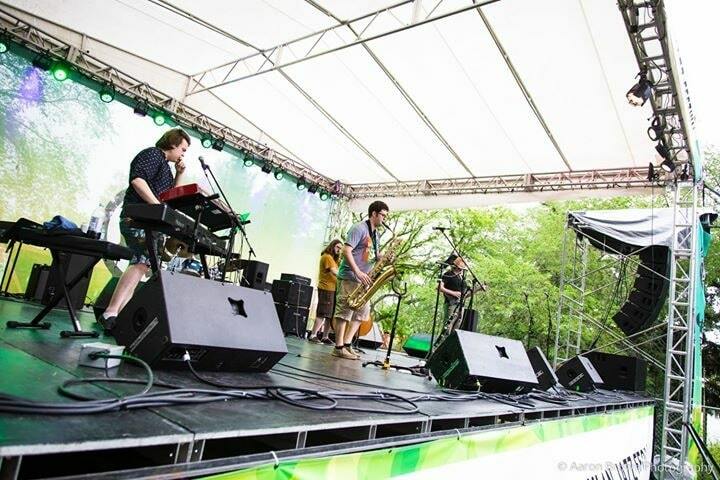 We’re always appreciative of the opportunities that the jazz festival gives us. With the smaller groups we played some great events, including the City Park Community Association’s Gatsby Night, Make-A-Wish Foundation’s Brunch, Bubbly, and Bling, and our first ever wedding ceremony. 2019 is shaping up to be a great year for the band in all its sizes with three trio gigs and a quintet gig booked in the first four months. I played with a fair amount of other groups in 2018 which is new for me and I had a great time doing it. I had a great year with the Toon Town Big Band, playing our annual shows, including our feature performance at The Broadway Theatre. After university was over, I really missed playing in a big band, so it’s been great to be back doing it. 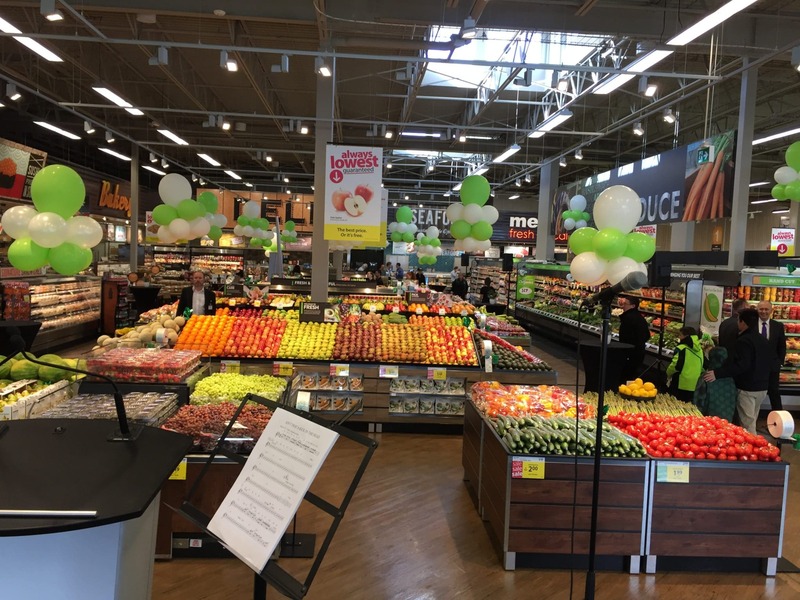 With the Drew Tofin Band, we were pleased to be invited to our second time playing for the grand opening of a Save On Foods. It is a rather interesting experience when you look out from the stage and directly in front of you is the produce section. The Howlin’ Huskies Pep Band had a great start to year, but it unfortunately went down hill very quickly. Both Huskies basketball teams were having a great season and ended up with home playoff games, but due to budget issues Huskie Athletics decided to replace us with a DJ. That was just the first road block. Come fall, we were expecting to be back for football season, but they decided to scrap us there as well. Then, come basketball season, we were dropped again. This could mean the end of the Howlin’ Huskies Pep Band, but hopefully not. If it is though, we’ve had a good run and it’s been lots of fun. Back to happier times! My year is ending in a pretty exciting way. I decided to take a step outside my comfort zone and signed up for Band Swap. 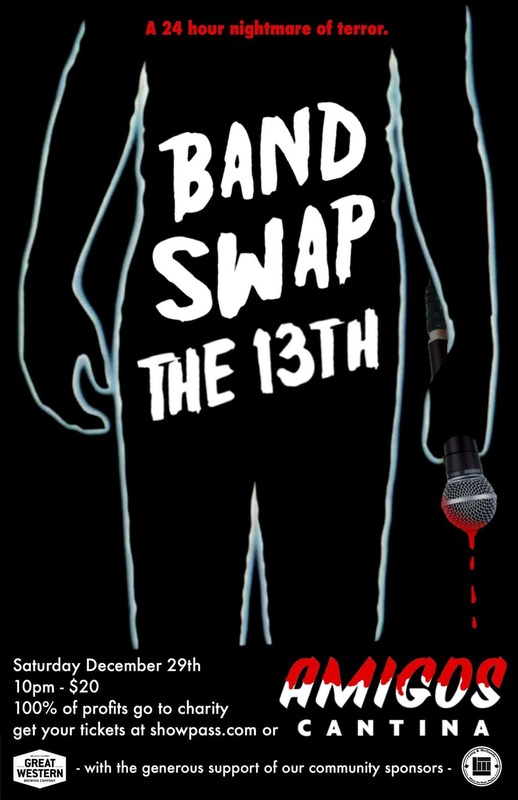 For those that don’t know, Band Swap is a charity event where 35 musicians get together, split into 7 bands, and have 24 hours to put together a 20 minute set. This is coming up this Saturday night, December 28th. It’s all for charity so come on out! However, that’s still not the end of my year. I’ll be playing New Years Eve at the Cosmo Seniors Centre in Saskatoon with the Oral Fuentes Reggae Band. This is my first time playing with this group. It’s been a lot of work to get ready for this show, stepping out of my comfort zone again and learning all the tunes by ear and memorizing them, a skill I’ve been wanting to work on, and I’ve had a lot of fun doing it. 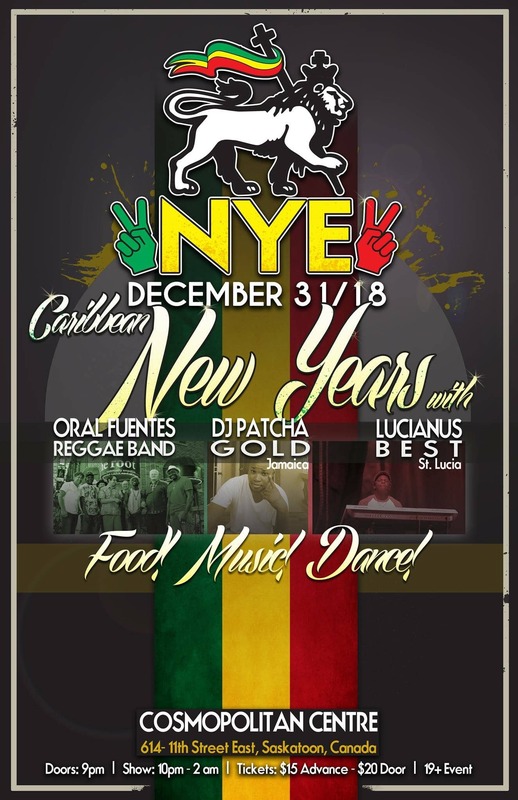 Come on out for a Caribbean New Years Eve! I’ve had a pretty busy year of teaching. I’m now in my 8th year at the Saskatoon Academy of Music and I’m privileged to have fantastic students and coworkers there. I also have one student who I’ve been teaching in their own house. He’s a great kid and a dedicated student who I have really enjoyed teaching. I’ve also been trying to set up a home studio at our new place out in Rosetown, but have not yet had any students sign up. This year I really kept busy with teach band clinics, teaching ten in total this year. The number of clinics I’ve been teaching has been growing each year and I really enjoy doing them. I’m very happy to see so many schools doing a second round of clinics in the spring to give their students an extra boost before their year end concerts. This year brought a big change in my personal life when my wife accepted a job in Rosetown. We immediately decided she would take the job, but we didn’t immediately decide that I would go with her. We both recognized that living in Rosetown would add a major challenge to my pursuit of a career in music. After giving it some thought though, I decided to go with her. The lower cost of living meant that I didn’t need to have a conventional job. The deal was that I would split my time between music, a new work from home, commission only, sales job, and taking care of the house. It’s challenging at times, but so far it’s working and we like it. It’s meant a lot of help from our families though. We didn’t have a place in Rosetown until October 1, but our lease in Saskatoon was up at the end of August, so Chelsea spent September living in Biggar with my parents, and I spent most of September living in Saskatoon with her parents because I was busy with beginner band clinics. Even though we now have a place in Rosetown, I still need to spend a lot of time in Saskatoon which means I’m staying with my in-laws A LOT. I’d really like to thank Chelsea’s parents for supporting me in my pursuit of this career by giving me a place to stay and feeding me while I’m there. It really makes a huge difference in my ability to make this work. I’d also like to thank my parents for giving Chelsea a place to stay in September. It made a huge difference to her by cutting half an hour off her daily commute for that month. I’d especially like to thank Chelsea for giving me this opportunity to chase a dream. It takes a really special person to understand that this is what I really want and to support me on the road there. She recognizes that even though I don’t have a set schedule and I’m not always making money, that this is still my job and that I am working. I am eternally grateful for this. I always wrap these things up by giving thanks. First, to the people who come to my shows and support my dream. It’s always great to play for people you don’t know, but it means so much to see familiar faces in the audience because it tells me that people believe in me. I’d also like to thank all the musicians I’ve work with this past year, particularly Larry Hume, director of the Toon Town Big Band, my good friend Drew Tofin, and Oral Fuentes for giving me the opportunity to play with his band. Last, but certainly not least, I’d be lost without my bandmates, Michael Stankowski, Bryn Becker, Nevin Buehler, and Dylan Smith. I’m thankful to have such talented musicians to work with and I’m grateful to have such a great friend in each and every one of them. Hey readers! Before we get to the topic of buying a saxophone I just want to update you on something. If you haven’t already heard, the Marc Holt Quintet is hitting the road for a couple of days in October! We are in North Battleford at The Gog on Oct 7 and Edmonton at Café Blackbird on Oct 8. Hope to see you there! Anyways…. Sorry it has been so long since my last post. I’m going to try to do this more regularly. This time around I want to talk about purchasing or renting an instrument, specifically saxophones of course, but before I start I want to state that I am not paid nor contracted by any of these brands to endorse their instruments. 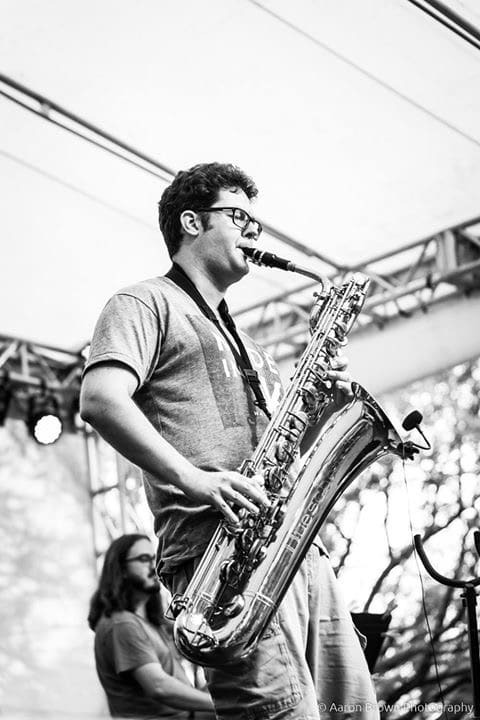 Unlike instruments such as pianos, guitars, and drums, which you can by cheap version of and still make sounds on, when it comes to saxophones, cheap instruments often don’t play properly, don’t play at all, or very quickly fall into that category. This is because of the way saxophones work. The pitch is changed by making the instrument longer or shorter by covering or uncovering holes that are precisely measured to play in tune. When you close a key, a ‘pad’ on the under side of the key seals the hole causing air to move further down the instrument, thus making the pitch lower. If the key does not seal properly, the air like can cause squeaks, honks, wobbling sounds, or no sound at all. Playing on a poor quality instrument can be extremely discouraging to beginners of all ages, and often ends up as wasted money. This is all to common of a problem on cheap instruments, which is why it is important to always purchase or rent a quality instrument. Let’s start by talking about beginner instruments, also known as student models. Unfortunately there are very few manufactures that make quality beginner saxophones and A LOT that make very poor quality saxophones. In my opinion, and the opinion of many teachers, Yamaha makes the best student model saxophones. They retail for around $1200 for an alto and $2200 for a tenor and they are worth every penny. Other quality manufactures of student model saxophones include Jupiter, P. Mauriat and Selmer and they sell for around the same price as the Yamaha. When it comes to brands to avoid, there are far too many to list, so here are a few guidelines. First, if it is an alto saxophone you are buying and it costs less than $1000 brand new, don’t buy it. If it is a tenor, avoid anything under around $1500. Second, if it is a colour other than brass or silver, you probably shouldn’t buy it. Third, if you can buy it in a department store such as Walmart, Sears, or Costco, definitely do not buy it. If you follow these rules you should end up with a good quality instrument that will last many years if it is well taken care of. If in doubt, ask your band teacher or private instructor to help you pick one out. No qualified teacher will recommend a poor quality instrument. When it comes time to move up from a beginner instrument to an intermediate model there are a few more options. Selmer and Yamaha are still very good choices. Yanagisawa also makes some good quality student instruments. As for P. Mauriat, their intermediate models can be ok, but there are definitely better choices. Intermediate model Jupiter saxophones do exist, but the quality isn’t really there. The rules for buying an intermediate model saxophone are mostly the same as buying a beginner model. In price, expect to pay $2000-$3200 for an alto and $3000-$4500 for a tenor. Colour gets a little looser at this level. There are some quality instruments in bronze and black, but brass and silver are still the standard. If it is a colour you would find in the rainbow you should not even consider buying it. The one rule that does not change through all levels is that you should never buy an instrument from a department store. One thing to keep in mind when buying an intermediate level instrument is that at this level, the player is starting to develop their own sound and they are also starting to understand what quality feels and sounds like, so you should always try an instrument before buying it. I still recommend seeking the assistance of your teacher, or if you aren’t currently taking lessons, a qualified teacher or professional in your area would be able to assist you. By the time you get to the point of buying a professional level instrument you should know your instrument well enough to make your own decisions on what is a quality instrument and what isn’t. If you are not, you are probably not ready for a professional instrument, but I will still provide a little bit of information about brands. Selmer and Yamaha are the gold standard in most professional communities. You really can’t go wrong with either of those brands. Yanagisawa also makes some very good quality professional level instruments. There are some others that there is much debate on the quality of the instrument, mostly because they have a different aesthetic appeal than most traditional instruments and they also tend to retail for a lower price. Two of those brands are Cannonball and SeaWind (which is a Canadian company). I personally think that both of these manufacturers make great quality instruments and would recommend them to my students. As I stated before though, at this level it is about what you want so you definitely need to be trying multiple instruments and comparing them before purchasing. A teacher or trusted professional can still be of great assistance at this level, but make sure that you are buying something that YOU are happy with. When it comes to buying used the game changes a little. For beginners I highly recommend having your teacher or a trusted professional to help you out with the process. Stick to the same brands mentioned before, but make sure the instrument has been well taken care of and is in good working order. Prices will obviously vary when buying used instruments so use your judgment. If it seems too good to be true, it probably is. For intermediate and professional instruments al the same rules apply to used as they did to new instruments. However, when it comes to buying vintage instruments you really need to do your research and learn which vintage instruments are good, which are not, and what they are worth. Again, if it seems to good to be true, it probably is. What it all boils down to is just be smart about what you are buying. You will get what you pay for. Buying a quality instrument is so important for a new saxophone player to set them up with the best chance to succeed. If they have to play on an instrument that doesn’t work they won’t first assume that the instrument is the problem, but they will assume that they are the problem and they will quit and be discouraged for years to come. If you are in the process of buying an instrument and have any questions please feel free to contact me. I would love to help. If you like or disagree with anything I said here I would really like to hear about it. Thanks for reading!